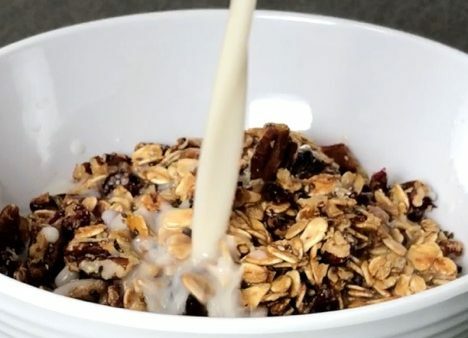 Finding a good gluten-free cereal can be hard (and expensive) but once you try this recipe you won’t buy store-bought cereal again. The base of this cereal is made with the Only Oats brand of gluten-free oats and uses agave syrup for the sweetener. Roughly chop pecans and dried cranberries. Add gluten-free oats, pecans, dried cranberries and agave syrup into a large bowl and mix together. Add coconut and chia seeds then mix. Spread out mixture onto baking sheet lined with parchment paper. Bake at 325 F for 20 mins stirring halfway. Enjoy!